If a little garlic is good for you then more is better and this blend is loaded with it! One bite and you will be transported to France! Great for dinner or snacking. Form into links, chubs or sticks. Pork meat is most commonly used, but you can also use beef, lamb, veal, turkey, chicken or any combination of your choice. 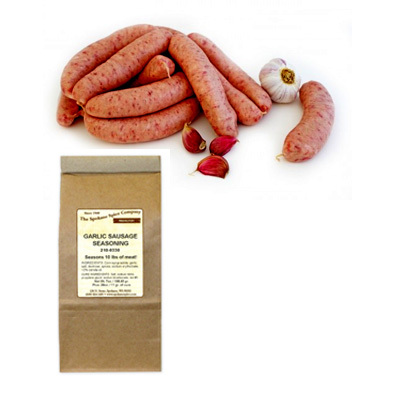 It is an excellent blend for wild game meat. One bag will season 10 lbs of meat. It can be used as smoked or fresh product. The Nitrite cure is packaged separately. Ingredients: Corn Syrup Solids, Garlic, Salt, Dextrose, Spices, Sodium Erythorbate, canola oil.